I had to put the top back on the Jeep yesterday. I was not real happy about it. But they say it's going to rain all week so, you gotta do what you gotta do. My favorite part of the year is the part when the top is off the Jeep. I love the wind, the fresh air, the feeling of freedom...it's awesome. Yes sometimes it's loud and it even is a bit gross when you pass road kill, but overall it's awesome. My life gets that way sometimes too. I love the fun, freedom, excitement, and then the rain comes and you have to cover up. Stuff happens. You get distracted, frustrated, and even mad. You feel as if your freedom has been taken away or your "rights" have been violated. You don't want to take time to put the top on. You want to continue enjoying the free-wheeling excitement with the wind in your hair and the sun on your increasingly balding head. But you can't. You have to deal with the things that life throws at you. Just because you have to put the top on doesn't mean that life can't still be fun and enjoyable. This rain will not last forever. The sun will shine again. The temperature will go back up. Things will get better. They always do. Don't hang out in the rain. Seek the shelter you need in God's grace, mercy, wisdom and power. Let Him help you deal with the stuff that happens. And look forward to taking the top off again. BTW...just checked the forecast. Top may come off Saturday! Well He did it. He showed up and a BIG way and made Himself the center of attention. Don't know why I am so surprised. Don't know why I didn't expect it. After all, that's just what He does. Our Easter celebrations were amazing. We had the largest crowd we have ever had in the short history of our church and, most importantly, we saw 5 people give their life to Jesus! When we present a risen, living, loving Savior in the power of His Holy Spirit and leave the results to the Father, well let's just say He does His thing. And that's what happened yesterday. I am so proud of all the people who worked so hard last week to prepare for Easter. It is a joy and an honor to serve with you. As many of you know, last week was crazy. The devil did his best to distract and frustrate us but we did not give in or give up. We have the power of the resurrection available to us and we used it to overcome all the junk that was thrown at us. God is so stinkin awesome! So What? Let's make this more than just an Easter event. 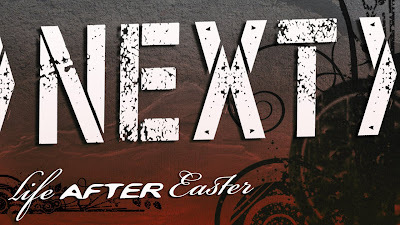 Our new series, NEXT: Life After Easter, is going to help us do that. Invite someone to come with you. Get ready to live in the power of the resurrection. It's going to be awesome. What a strange name for this day. The fact is, the only thing that has ever been "good" was brutally murdered on this day. Yet we call it "good" Friday. The crucifixion of Jesus was not a pretty thing. History tells us it was the most cruel, harsh, painful way to die. The Romans had perfected the "art" of killing in their day. When Jesus died on that cross, He was dying because of and for all of our sin: past, present, and future. You see, the only way for sin to be paid for, or forgiven, was for something to die for it. It was a system of sacrifices that God established years ago. So when Jesus died, yes all the way dead, on the cross, He paid the price for our sin. He became the sacrifice for us so that we would not have to pay the ultimate price for our own sin. He did it for us. That's what makes it "good." So What? On this Good Friday, take some time to thank God and Jesus for the price that was paid. God gave His one and only Son for all of mankind so that none of us has to pay the price for our sin, if we will only put our trust in Him and allow Him to control our life. All we need to do is receive Him into our life and follow His plan for us as it is laid out in the Bible. I hope you have a GREAT Friday and remember...Sunday is coming! He did not stay dead. He is alive so now we can live. Stinkin Awesome Sunday is Coming! I guess it's going to be an awesome day. Usually, when things go the way they have for the past two days, Sunday turns out pretty stinkin awesome! I have had so many distractions, frustrations, and generally stupid things happen this week. Here I am trying to prepare for the biggest day that Christians celebrate and I'm facing all kinds of junk. I was thinking and praying and realized what was going on. The stinkin devil was doing a number on me. He was working hard at messing me up and getting me off track. Man, he is good at what he does. But we have the power in Jesus to handle his sorry...self. I was praying and telling the devil to step off and God helped me get my stuff together. I would like to say that things went really smoothly today, but that's not true. I just handled things a little better and everything got done that needed to be done. So What? Don't let the junk that the devil throws at you keep you from getting in on God's best. Tell the devil to get out of your grille and call on God's power to help you through. Remember, Easter is all about the power that raised Jesus from the grave so that He could prove that He has beaten sin and the devil. As a follower of Christ, you have that same power available to you. Get ready for an awesome Sunday! My oldest turned 20 yesterday. I know what you're thinking, "Wow Doug must have been about 15 when he had his first kid!" Thanks for that compliment. As I think about the past 20 years, a lot has happened. Obviously, my son has changed, but I have too. He has become a very cool, mature young man. I am more proud of him than I can say. God gave us great wisdom as we raised him and we are now seeing the fruit of our labor. I can only hope that we do as good a job with our next two. I think it's pretty cool that he still likes me a lot. We have a lot of fun together. He talks to me about everything and is really excited to share important things with me (even though sometimes it's by email or text). We are close and I hope we get closer. I've really changed over the past twenty years. Not just physically either. A.D.D. MOMENT-m youngest pointed out my "white streaks" on the sides of my head the other day. Changes have come in many forms. Some of them have been easy, most have not. Most of them for the good, some, not so much. Yet looking back I can't really say that I would change a thing. The good, the bad, and the ugly have all made me what I am today. And I like who I am today. So What? Don't be afraid of change. Embrace it. Enjoy it. Learn from it. But along the way, take time to evaluate and let those that have helped you through know how much you appreciate them. Love you Son. Very proud of you and who you have become.